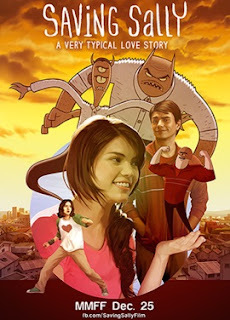 One of the few 2D animation film created and produced by Pinoys, a love story of two geeks played by Rhian Ramos as Sally and Enzo Marcos as Marty. Directed by Avid Liongoren under Rocketsheep Productions. Included in the MMFF 2016 released last December 25, 2016. It started when Marty, an imaginative, aspiring comic book artist,and a school geek met Sally, an amateur inventor who saved him from being bullied in high school. Since then, they have become best friends. They shared creative ideas and both artistic. As the time passes by, Marty started to fall in love with Sally. He started to create comic story using her as an inspiration. Marty noticed that Sally's adoptive parents is strict to her and he suspects that they're abusing her because of the unlikely bruises she gets. After the two graduated from high school, they decided to apply on the same College taking Fine Arts. Unfortunately, Sally was on the waiting list applicants while Marty was accepted. Then, Sally had a boyfriend breaking Marty's heart. As he continue his comic story, he keep on imagining Sally's boyfriend being a dickhead and even included it in his story. Another challenge is how Sally can be saved from her strict parents. They sneaked her out just to spend time together and have fun. Then one day, Sally and her boyfriend broken up because he was caught cheating. Sally went to Marty's house and there she discovered a secret drawings of her. Marty admitted his love to her but she rejected him. He became depressed and gave Sally a comic book with sad content. The two best friends separated lives after that accident as they entered college. They can see each other some time in their campus. Both had their own relationships but failed in the end. Sally realizing that overtime he have feelings for Marty. She sent him a pop-out book showing their adventures together to make Marty happy again. And that moment, Marty took courage to confront Sally in her house. On his way there he overheard that Sally is being abuse by her parents. He came knocking the door and pulled Sally out of their house. Then Sally brought him to this 'secret project' she have been doing for a long time, a secret hide out where she can live from now on. The two graduated from college and became a couple. It's a simple yet imaginative movie. The animation is incredible and kudos to the producers and director, because of their persistence and commitment after a decade the movie was finished. The special effects and sounds are superb as well. I can say that this movie can compete internationally. And best part is, it a movie for all ages.